2) to assess the capability of different modelling/analysis approaches to predict the seismic response of these masonry structures. a. Tests on a 1:1 scale model of a brick unreinforced masonry cross vault: to investigate the behaviour of brick masonry cross vaults under different seismic inputs, in terms of damage, displacement capacity and peak acceleration. b. Tests on a 1:1 scale model of a brick reinforced masonry cross vault: to evaluate the effectiveness of reinforcing techniques to repair the vaults tested in a). 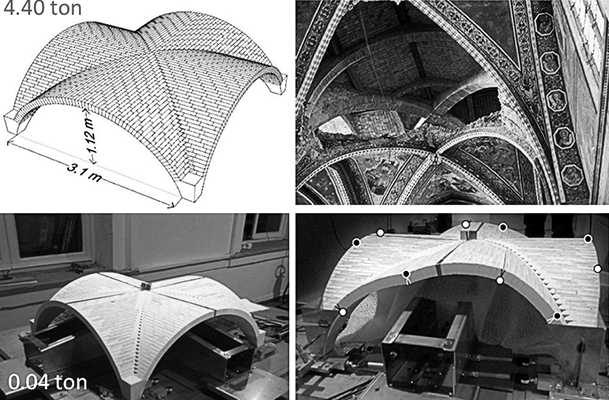 c. Test on a 1:5 scale cross vault made of 3D-printed blocks assembled with dry joints: to validate the efficacy of static tests on scale mock-ups, performed in earlier studies, to describe the seismic dynamic response of masonry vaults. In addition to the experimental tests, numerical simulations will be performed to assess the efficacy of different modelling strategies and analysis techniques. The final aims are to improve the safety assessment procedures proposed for historic masonry buildings in Eurocode 8.3 and to provide better seismic assessment techniques and strengthening measures.